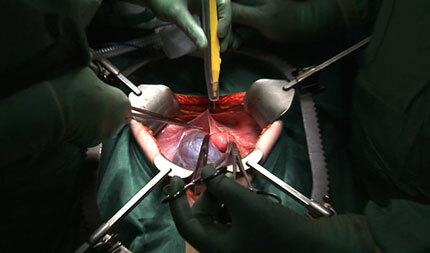 If you’ve watched any videos of open surgery you’ve probably noticed the apparent darkness of the OR. The lights seem to be turned off, except for the surgical light which keeps the surgical field brightly lit. And yet, surgeons don’t perform open operations shrouded in darkness, do they? The OR is of course also fully lit. To the people present in the room, the operating field will only seem slightly brighter than the rest of the room. The darkness visible on the video is due to the video camera’s relatively low contrast range compared to the human eye. This post is going to be a bit technical, but hopefully understandable (even for surgeons ;) ). Where our eyes can handle a contrast range of between 1000:1 and 2000:1, the best professional video cameras can handle at the most 128:1 (7 stops). Smaller cameras like the Panasonic AG-HVX200 and the Sony HVR-Z1 can only handle a range of 64:1 (6 stops). Standard office lighting can range from 400 to 1000 lux. A surgical light however, can have a luminous emittance of up to 100,000 lux. In an OR the contrast between the brightest part illuminated by the surgical light and the brightest parts of the rest of the room will be about 100:1. This alone is more than most cameras can handle. Taking into consideration the less brightly lit areas of the room, the total range can be over 2000:1. Our eyes can handle this, but not the camera. When a scene’s lighting contrast exceeds the camera’s range, detail and tonal gradation will be lost. The lightest areas will appear as solid white and the darkest areas will appear as solid black (see figure). Adjusting the exposure will not widen the camera’s range, only move it up or down the scale. The surgical wound is the subject of the surgical video. The exposure will consequently have to be adjusted so the tones of the surgical field are reproduced correctly. By doing this most of the area outside the surgical light beam will appear as very dark or black, as in the video still above. You get, to misquote Bruce Springsteen, “darkness on the edge of wound”. Most lenses provide the best picture quality around the middle of the aperture range, typically f/4 to f/5.6. Working in a television studio or other locations where you can control the light, it is desirable to first set the aperture to e.g. f/4 and adjust the lighting to fit this. In the OR this is not possible, so other measures has to be taken to avoid working in the largest or smallest apertures. To do this we use neutral density (ND) filters. These are filters which reduce the light of all wavelengths equally, providing lower exposure without altering the colors. ND-filters come in different densities. A ND8-filter reduces the aperture by 3 stops. Using this you can reduce your working f-stop from f/11 to f/4, allowing you more room to adjust the exposure and provide the best picture quality. When shooting the surgical field or parts of it, the surrounding darkness helps to guide the eyes of the viewers and exclude unimportant picture information. When shooting wider pictures of the OR, e.g. cutaway pictures of the surgeons at work, it can be problematic. These pictures must be exposed to reproduce properly the part of the room which is not illuminated by the surgical light. To avoid clipping, the much brighter surgical field must be left off-screen, restricting the freedom of composition. So these exposure challenges are both negative and positive. It’s important to know them to get the best possible footage from the OR. You are currently reading Darkness on the edge of wound at The Sterile Eye.